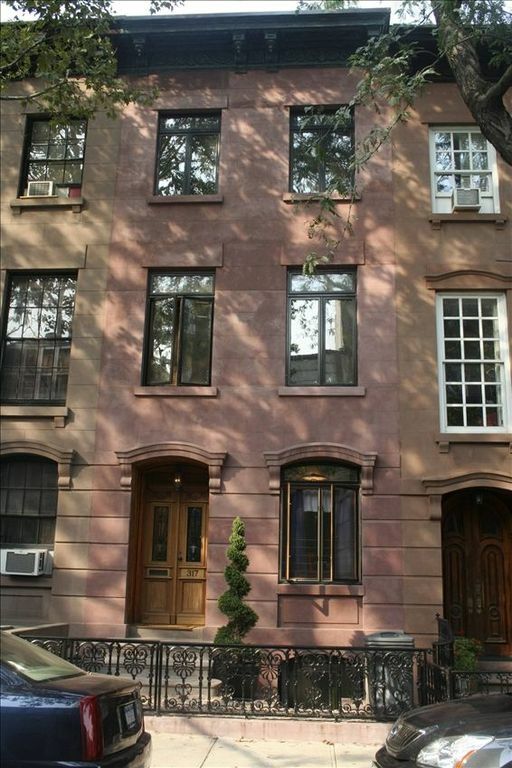 A sunny restored 1880's brownstone Studio on a beautiful tree lined block only 2 blocks from the subway (F & G trains..4, 5, 2,3 trains about 15 blocks walk). The main room is roughly 16' by 16' (5m by 5m). It is on the 2nd floor of the brownstone. Located around the corner from Smith street, one of the culinary centers in New York.. a block away from Zagat's #1 rated restaurant in 2006 (The Grocery). Within a blocks walk, there are Thai, Italian (2), Cuban, Caribbean, Chinese, Middle Eastern (2) restaurants as well as a new wine bar and pubs. Sushi, French Provincial, French bistro, and amazing pizza are nearby. The neighborhood also has plenty of groceries, delis, vegetable stands, fish markets, and butcher shops nearby, including great italian markets reflecting the neighborhoods Italian-American heritage. There is a nearby bus that goes to Prospect Park, Brooklyn Museum and Botanical Garden, and Zoo. Manhattan is 4 stops on the subway via the F train, 1 stop on the 4, 5 train. Times Square is about 35 minutes subway ride on the F train. JFK is about an hour away via subway (the A and F or G trains). Our home is located on Sackett Street between Smith and Court Streets. Original wide pine flooring, original wood shutters, non functioning fireplace, and exposed brick add to the warmth of the just completed renovation. AC is provided for the steamy summer days. Cable TV with premium channels, free Wi-Fi, compact kitchen with microwave/ convection oven. There is a glass shower in the bath (no bathtub). Iron and ironing board provided. Pocket doors can be closed between main room and kitchen and kitchen and bathroom. The leather sofa unfolds into a queen sized bed as well. Down comforters and fluffy pillows. Ceiling fan for soft breezes. Smoking Policy – there is absolutely NO smoking in the apartment. Cancellation Policy – Cancellation within 60 days for a full refund or 30 days for 50% refund. If we book the dates you have cancelled we will refund you 100% less any fees incurred. Shower stall with sink. All towels provided. Hair dryer, curling iron. I have done many, many VRBO s around the world. This was the most minimally furnished and small kitchen ever. Shabby furniture. Tape on chest of drawers and couch. Silverware kept in bathroom. Was clean, sunlit and nice neighborhood. Sorry you felt the apartment was not outfitted well. I have 119 reviews and am a 5 star property. As advertised, this is a studio apartment with an efficiency kitchen and bathroom. We are currently upgrading the apartment with a new fold out couch and linens. Anytime something is missing from an apartment, please let the owner know. Loved this neighborhood. It was a very easy subway trip to Manhattan. I would definitely stay here again. This is our second time at this lovely brownstone. It's clean and dry and had everything we needed. The last time we were here it was 98 degrees and the air conditioner did a great job keeping things cool. This time around it was cold and rainy, and the heater and featherbed kept things very pleasant. The walls /floors are paper thin, so this is not a place for you if you need things to be super quiet. But we'll definitely return. Oh, and the bed feels soft when you get in but I never once woke up with a sore back (and I'm picky about beds...so: good bed!). On the map it looks like the closest metro stop is 6 blocks away...but there's a closer entrance just two blocks down on Smith Street at President. Great location. Comfortable. Easy access. Quiet. Definitely recommend! This studio apartment was perfect for our visit to Brooklyn. It was in a great location, close to where our family lives and lots of coffee shops, pizza places, and other great food and stores. We traveled with our young child and appreciated having the pack n play available. Cassie was great at reaching out and responding. We highly recommend!